Thank you for showing an interest in West Island School and the English Schools Foundation. We hope you find the information included in this pack helpful. Should you have any concerns, please do not hesitate to give us a call. We shall do all that we can to answer your questions. The English Schools Foundation (ESF) maintains 16 international schools in Hong Kong. West Island School provides a modern liberal education for English-speaking students and enjoys an excellent reputation having been named an ‘Outstanding School’ by the Education Department. To be considered for a place please complete the application online. Instructions and the application form can be found on the ESF website www.esf.edu.hk – Admissions. Applications can only be considered if the Director of Immigration has accepted the family’s residential status and granted the relevant visas. We interview all our students before making an offer of a place and it is necessary that you supply an authenticated residential address in the catchment area of this school. The education we provide is similar in content and method to that currently available in England, though increasingly we recognise the international context in which we work. As English is the medium of instruction it is essential that students demonstrate fluency in English before a place can be offered. 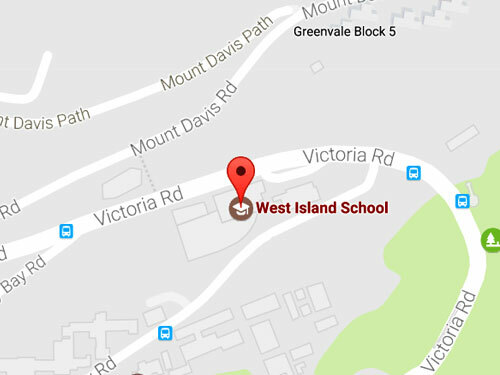 We assess all students applying to West Island School by the same process. For first language English students it is not an intelligence test in any way but an assessment to make sure that we can put students in appropriate years, classes and groups and that we can provide any support or enhancement that is necessary for your child to have the best possible education. The same applies to second language speakers of English who also need to demonstrate sufficient fluency in English. Generally, we conduct the interview when a student comes for the written assessment/testing for fluency. This usually takes place on one morning of each month. Once we have received a copy of your online application form and the supporting documents we will contact you to arrange for an interview and assessment for your child if school places are available. We will then give you more information about the interview/assessment procedure itself if you wish. Fees are charged at all ESF schools and must be paid monthly in full and in advance by the parent. We would point out too, at this stage, that if your child is offered a place in any ESF school a deposit of HK$16,000 and a one-off non-refundable capital levy (NCL) when students joining an ESF school from August 2015 per student are required to secure that place. The deposit is non-refundable and non-transferable but will be offset against the first term’s fees. Please visit www.esf.edu.hk – our schools/admissions-criteria/school fees for information. We look forward to hearing from you and hope very much that your application will be successful. Please visit the following two links for ESF schools admissions criteria and school fees for information.